Based on field surveys in northern Afghanistan, Zalmai Moheb, an ecologist with the Wildlife Conservation Society's Afghanistan Program and a doctoral candidate in environmental conservation at the University of Massachusetts Amherst, with others, report this week that they have for the first time documented by direct observation the presence of two rare Asian wild goat species in the country. The species, both of concern to conservationists, are the markhor (Capra falconeri) or screw-horned goat, and the Siberian ibex (Capra sibirica), which occur in several countries. Both have been reported in Afghanistan, but few studies have been made there in recent years and their distribution is largely unknown, Moheb points out. The report of field surveys he and colleagues conducted from July to October 2011 has just been published in the annual newsletter of the International Union for Conservation of Nature's Caprinae Specialist Group. 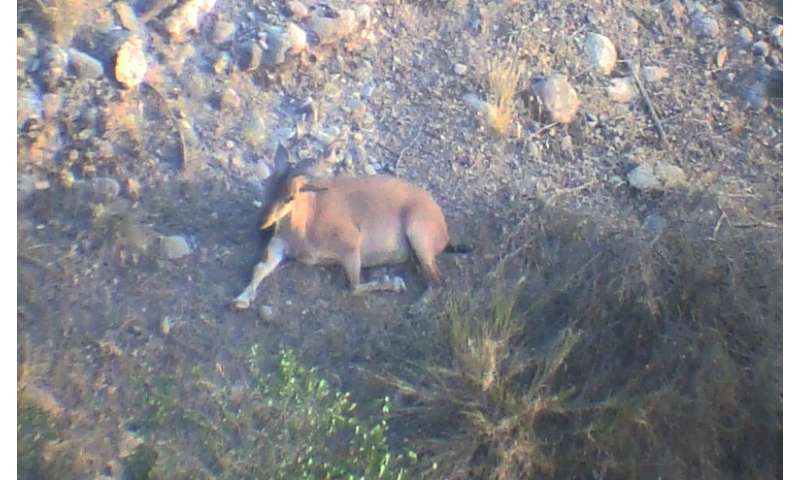 Moheb and colleagues report that they directly observed markhor and ibex on the Afghan side of the Amu Darva River, the border with Tajikistan, for the first time in the Shahr-e Buzurg district and the Darwaz region, plus indirect field evidence and local community reports. They say, "The strip of land along the Amu Darya River from western Darwaz to Shahr-e Buzurg district through Khawahan and Raghistan districts should be a priority site for future markhor and ibex conservation in Afghanistan. If protection measures are taken, this area along with the adjacent protected area in Tajikistan, could act as valuable and viable refuge for sustaining markhor and other wild species that inhabit the region." Moheb and co-authors Said Naqibullah Mostafawi and Peter Zahler, with the Wildlife Conservation Society at the time of the survey, plus his advisor at UMass Amherst professor Todd Fuller, point out that the animals are "nominally protected" from hunting, but both species are most likely hunted throughout their range by local tribesmen. Zahler is now vice president of conservation initiatives at Woodland Park Zoo, Washington, D.C. and Mostafawi is now a free-lance consultant. For this work, the research ecologists surveyed a strip of shrubby scrubland along the Amu Darya River in four districts of Afghanistan's northern Badakhshan Province. They visited 46 villages and four field sites, most in valleys, over 115 square miles (300 sq. km) in Shahr-e Buzurg and 770 square miles (1,997 sq. km) in the Darwaz region. They also interviewed and showed photographs to village headmen, hunters and shepherds believed to be the most knowledgeable about local wildlife. They also visited potential markhor and ibex habitats suggested by sources using experienced local hunters as field guides to confirm animals in the area. In Shahr-e Buzurg the ecologists report 41 of 67 respondents, 61 percent, said that markhor were present and once abundant, but numbers have declined and few remain. The researchers themselves saw four markhor in the Payan-e Moor area and local hunters said they thought about 20 markhor were in the area. They also found horns and markhor skins. In the Darwaz region, the researchers report that 37 percent, 15 of 40 respondents said markhor existed in the western part of the district, and the researchers themselves saw six animals and four pairs of markhor horns. Further, 56 percent of respondents, 74 or 131, said that ibex occurs in some parts of the region and showed them skin and horns. Overall, the ecologists say markhor populations in Shahr-e Buzurg are believed to be small and may only survive due to animals coming in from Tajikistan. Markhor populations in Leiwgard in the Kof Ab district of Darwas appear "larger and more stable," though still linked to nearby Tajik populations. "We suspect that when water level drops in the river during winter, markhor could move between both areas," the authors note. "The remoteness of Leiwgard is likely the primary reason that markhor and ibex still exist in this area." Leiwgard is home to roughly 80 markhor, sources said, along with ibex, brown bear and snow leopards. Local sources also reported that markhor and ibex share the same area, but markhor prefer lower elevations and steep cliffs, while ibex like higher elevations with colder environments. "This, if true, is one of the very few areas where these two caprid species overlap," the researchers note. Moheb and colleagues urge taking several conservation management actions to assist markhor and biodiversity in the area, in particular along the Amu Darya River. "This area is a priority for future markhor conservation and for other endangered wildlife such as snow leopard. The area has the advantage of being connected to the M-Sayod Conservancy on the Tajik side of the border, and so efforts could be combined between Afghanistan and Tajikistan to promote conservation in the larger area," they point out. Coordinating conservation efforts could preserve unique habitats and endangered wildlife, they add.